Alyson Renee "Aly" Michalka born March 25, 1989 is an American actress and musician. She works with Disney Channel and takes part in duo group 78violet with her sister, Amanda Michalka. She is most well known for playing the part of Keely Teslow on the Disney series Phil of the Future. Alyson Michalka was born in Torrance, California, United States on March 25, 1989 to Mark Michalka and Carrie Begley-Michalka. She was raised mostly in the city of Seattle, Washington. She is of Aztec origins. She has two dogs named Saint and Bandit. She began to be home schooled. She started acting for Disney Channel on Phil of the Future, then began her singing career. 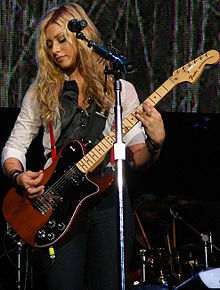 She says on Disney 411 that she started playing guitar with her sister at the ages of 12 and 10. She lives in a multimillion-dollar California mansion. Michalka has been singing since her sister was able to speak and sing. Then, for the movie Now You See It... her sister and she started a band and created a music video called Do You Believe In Magic?. The band is called 78violet. Then they left Disney Channel to "take off" with their musical career. Soon she started acting for Disney Channel in the show Phil of the Future, which she had quit in 2006. She has been seen in many movies, outside of Disney channel, she worked with WB and NBC with TV dramas with her sister. She was most known for playing Keely Teslow in Phil of the Future on Disney Channel, though now has gained popularity being in a band. She has been in other Disney Channel productions like Now You See It... and Cow Belles. She is half of the musical duo 78violet, with her sister. This page was last changed on 7 April 2019, at 11:23.